She also created the Chicaoji meso-american glyph. Brenna is a student of meso-american art and, in particular, the pictoral language of the cultures in the region we call Central America. Her Chicaoji glyph profoundly captures an essence of Chicaoji in a way that I find difficult to describe. 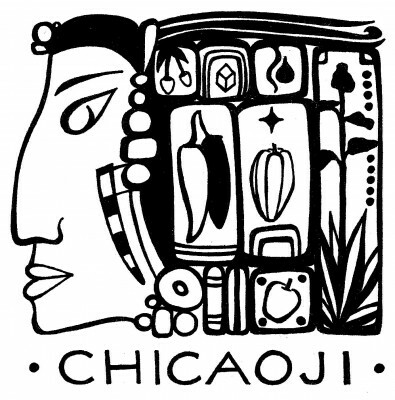 It is for all practical purposes the Chicaoji “logo” and I use it for everything from T-shirts to letterheads. 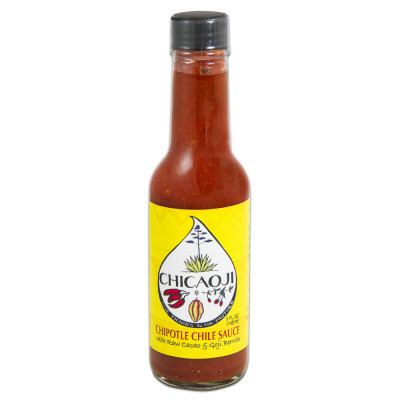 Notice that each component/ingredient of Chicaoji is incorporated into the image. With this glyph, Brenna has captured so much of what I am trying to express when I say that Chicaoji is a Gathering of the Healing Tribes. 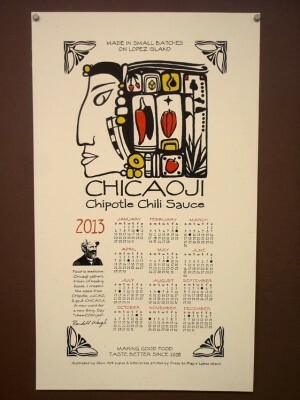 She and Karla Lillestol also made the amazing 2013 Chicaoji Calendar this Winter. They made these on one of those old timey one page/one color at a time printing presses that actually presses the text and images into the paper. They made and numbered 100 of these calendars. I have a few left at Chicaoji Central. They cost only $12 and all proceeds go to artists. You can also buy them on my online ordering system and Brenna’s Etsy website. Visit Brenna’s website: www.slowartlopez.com She has an Etsy site with a lot of cool art to choose from. for the past 3+ years, i’ve been publishing my autobiographical comix on blogspot; it’s an almost-daily hand-drawn journal that’s updated once or twice monthly. it’s personal and inane, but i keep getting feedback telling me to keep going, so i do. i’m new to the medium, so it feels like a simple and good way to keep practicing. released in autumn 2011: kuntri gurl comix presents: “don’t you have anything better to do?” an all new mini-comic-zine, available in my Etsy shop, BBearproductions. an entertaining read for only $3.50! I do not have words to describe how honored I am to have Brenna’s art included in the Chicaoji adventure.